Rindfleisch (or Rintfleisch) was a Franconian knight, who instigated the massacre of up to 100,000 Jews in Southern and Central Germany during a civil war between Adolph of Nassau and Albert I of Nassau. Rindfleisch may have been heavily in debt to Jewish moneylenders.ref Rindfleisch claimed a divine mission to exterminate "the accursed race of the Jews" following a rumor of desecration of the host. The "desecration of the host" was a medieval superstition which maintained that Jews defiled the communion wafer with blood. It is now believed that the wafers were attacked by a brownish-red fungus that looked like blood. Rindfleisch and victims, Hartmann Schedel, Liber chronicarum, Nuremberg, 1493. The massacres followed a series of blood libels in Mainz (1281, 1283) Munich (1285) and Oberwesel (1287). In Munich, Jews were burned alive in 1290. Likewise, there was an accusation of desecration of the host in Paris in 1290. 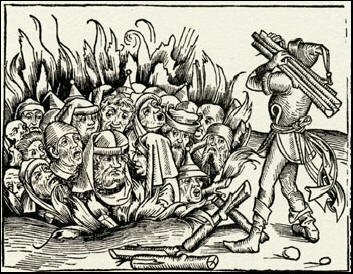 The massacres began on April 20, 1298 in the little town of Rottingen (also Roettingen, Rothingen), where 21 Jews were burned at the stake by Rindfleisch's mob as revenge for the alleged desecration of the host. Rindfleisch then led his mob on a rampage of slaughter and pillage. Massacres took place in Rothenburg, Nuremburg and Wurzburg. In the massacres, 146 Jewish communities were attacked and often destroyed in southern Germany. In Wurzburg, the Jewish community was annihilated on July 24. In Nuremberg, Jews took refuge in the citadel, which was attacked on August 1, 1298; 628 victims were recorded in the Nuremberg Memorbuch for 1298. (Ahituv, Shmuel, The Jewish People: An Illustrated History, Continuum, 2006, p. 251 [according to the Encyclopedia Judaica, the number was 728]). The Jews of Augsburg and Regensburg were protected by the intervention of their municipalities. From Franconia the massacres spread to Swabia, Hesse, Thuringia and Heilbronn.